Jackie Here. Working with community groups has always been a passion of mine. Connecting with people one-on-one can be impactful, but also intimidating. There isn’t a stage or podium to hide behind when you are shaking someone’s hand and asking if they want a sample of your vegetable salad! 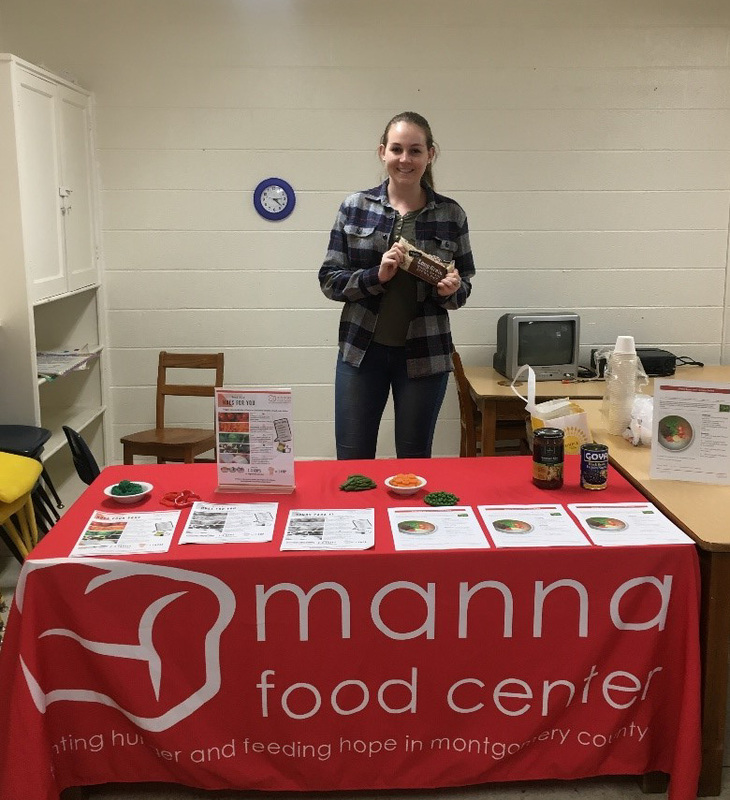 Luckily during my second week with Manna Food Center, I was able to interact with a live audience at the Glenmont food pantry in Silver Spring, Maryland to further develop my interpersonal skills. On the day of the presentation, I came prepared with all of the materials my internship partner, Isabella, and I had created. Colorful copies of “healthy hues for you,” recipe printouts, food models, and of course, the food samples were brought in. We were stationed off of the main hallway in a small room where the carts were held for the participants to shop with. Our table was proudly decorated with a bright red Manna tablecloth and displayed our education materials and hands-on activity. We were ready to go! Since we weren’t visible to the people waiting in line to be checked in, Isabella and I brought the samples and handouts to them. I noticed that people are were initially intrigued by the black bean and tomato salad which is when I could talk to them about the varieties of vegetables we included. I would ask them what vegetables they like to cook with, do they not like preparing some varieties, and has Manna introduced them to any new produce. It was great hearing what people’s individual likes and dislikes were. Many people would light up when they listed off what they have received from Manna; some were vegetables I had never heard of before like watermelon radish. Along with the nutrition table set up in the room, there was a cart with free children’s books for the taking. While some parents were checking in with the volunteer at the desk, we would ask kids if they wanted to peruse the books. I was usually greeted with a bashful smile, a nod and then the tiny tots would dash over to the racks. This is when the food models really came in handy. I asked one girl if she recognized the vegetables I had displayed or which ones she liked. I found out she LOVED broccoli and couldn’t get enough of baby carrots. Bell peppers weren’t her favorite but the squishy bell pepper rings were fun to play with! The main take-away I had from the evening at Glenmont was that people generally like to talk with you. People can be at the food pantry for all different reasons but talking about vegetables doesn’t have to put them on guard. I gained a greater understanding for the variety of people Manna serves, from all different ethnic backgrounds and ages. Being an intern at Manna was a very special and unique rotation. I hope that Manna can continue offering nutrition education to the clients they serve!